Launched in May 2016,the Mentos Choco range has exceeded all expectations of distributors Stuart Alexander and brand owners Perfetti van Melle. Supported through in-store sampling and social media activity, Mentos Choco ranked in the top 10 SKUs in both candy and mints in convenience (Nielsen Australia Convenience, QTR to 7/8/16). Contributing 5.3 per cent to total candy/mints category value sales, without full distribution across the convenience channel, sales have been incremental not only to the Mentos brand, but also within the category (Nielsen Australia Convenience, 12 QTRs to 7/8/16). “Mentos has achieved its highest market share in convenience for the past three years with Mentos Choco being a huge contributor delivering sales well above forecast,” Stuart Alexander Head of Marketing – Confectionery Paddy Bryans said. 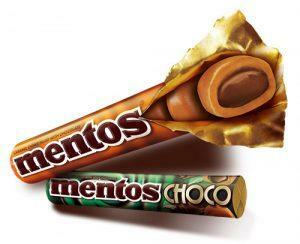 “Mentos Choco Caramel sold 248 per cent of the forecast, and Mint 195 per cent. “This result in convenience was similar to our experience with IGA, with Mentos also achieving its highest value market share in at least three years at 24 per cent.